Choosing the right yarn can be so difficult! I didn’t get a lot done last night, but I did sit down to my stash and figure out what yarn I want to use on my Android project. This is probably the most thinking I’ve done when it came to colour. I have a few different neon-ish greens. One is cotton, one acrylic, and one actual wool. 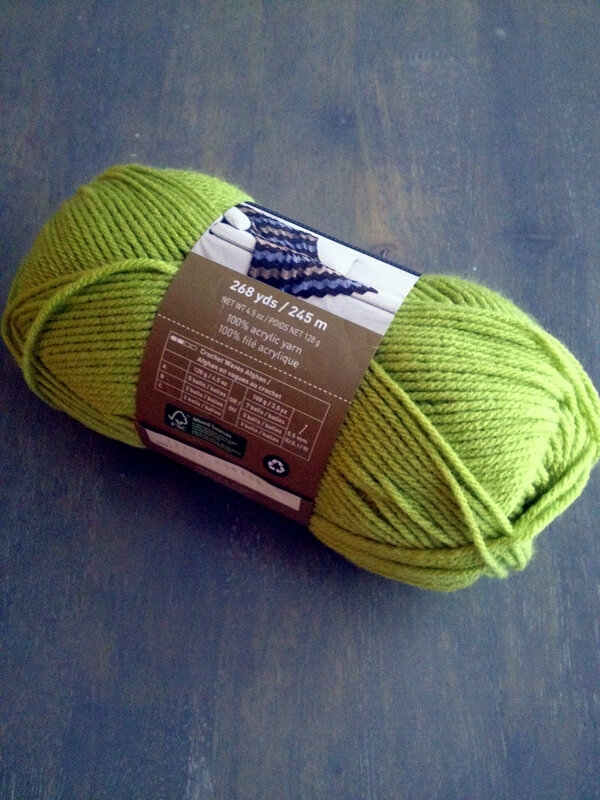 I think I’ve decided on the Impeccable yarn from Loops & Threads in the colour Grass as it’s more Android-y than my other options. The green is fairly vibrant, which I really like. That, and I’m a bit tired of the cotton, and I think I’m keeping the wool for another project. I’m not overly fond of acrylic, but I have such a large stash of acrylic yarn (almost all “inherited” from a knitter turned weaver) that it seems a shame not to use it up on fun projects like this. I didn’t get any knitting done yesterday, though, but it was still a pretty good day. A friend came over and hung out and then when husband came home from work, we all had spaghetti together. We actually ate at the table! Usually, the table is just a backdrop for photos. We almost never use it when eating dinner. I have a feeling this just isn’t going to be a very crafty week overall. I’m hoping to get started on the Android after work this evening. Tomorrow, though, my husband, my friend, and I will be travelling down to Austin to see Snow Patrol. (Technically, I wanted to go to see Ed Sheeran for my birthday, but he’s cancelled and won’t be there anymore. Gary Go will be there instead; needless to say, I was really bummed.) I might bring knitting for in the car just to keep busy. It’s not a long trip, but traffic can be annoying. Then, Friday is Employee Awards Day! In a way, I’m kind of excited. I don’t do sports (at all), so I won’t participate there. I might be able to find a little nook to tuck myself into to knit during a game of Bingo or during a film. The email said there would be a movie shown, but I have no idea what one, where, or when. Still, it should be a lovely day. All of that’s not quite adding up to a fully crafty week, but maybe more on the weekend. Ooh! Have a great time seeing Snow Patrol! I have the worst time with my stash. Sometimes I bought yarn because it’s so pretty or so soft or whatever, but if I don’t have a project immediately in mind, it sits. Or I find a great project for it, but I didn’t get enough and it’s been too long to find the same dye lot. I’m trying to work through my stash right now (for the most part — I still slip up and the occasional hank of yarn follows me home). After I get a handle on what I already have, I’m going to try to be disciplined and only buy yarn with a project in mind. Yeah…. we’ll see how that goes. That happens to me all the time! I’ll see something pretty or really soft, or I have some fun yarn that I just wanted to try, like my Mirasol K’acha yarn that I bought mostly because it was on sale. There’s not enough to do much with it, and it’s too late to go back for more.